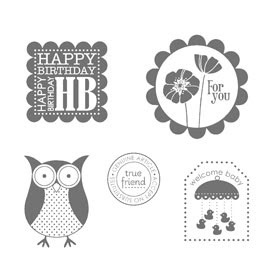 The Serene Stamper: Sale-a-Bration FUN!!!! This card was featured on the Stampin' Up! website for demonstrators. I just had to make it! I demonstrated this technique at my last two workshops and everyone loved it! WOW! Have I ever been busy! BUT, I've been having so much FUN too! Sale-a-bration has gotten off on a great start! Everyone is lovin' it - as they always do. FREE stuff! How could you go wrong? It's so neat to see people excited when they place their order and realize that they get one, two, three or more FREE SAB stamp sets and/or accessories! Don't miss out on this once-a-year promotion! Contact me to book your SAB workshop today! Check my Calendar of Events to choose your date - then just send me an email and I'll get your hostess kit to you right away. I love this time of year!!!! Did I mention, FREE STUFF?????? 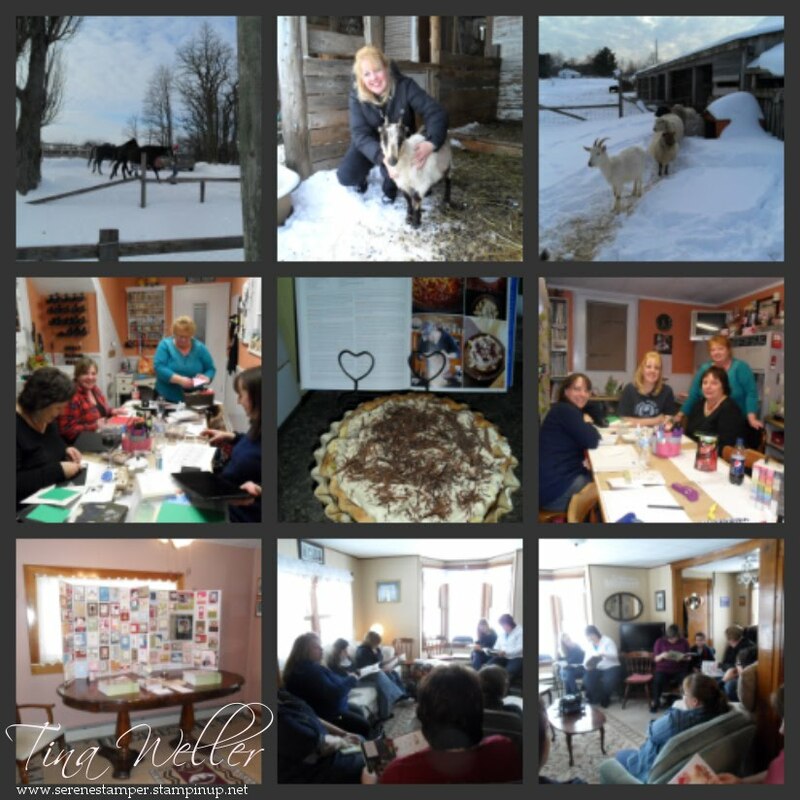 Last week I had a private card class, PMS night and two workshops! For the private class I was asked to demonstrate the Big Shot - and it was a BIG HIT! PMS night - which always happens on the last Saturday of every month (see details on my website) - was lots of fun. The 'P' this month was for 'Pie'. I made Jamie Oliver's Banoffee Pie - a popular pie in the UK. I had a taste of my hubby's while in England, and to tell you the truth, I didn't care for it. I'm not a huge fan of bananas. However, I made Jamie's recipe and IT ROCKED! We all just loved it! To make it yourself, check out my recipe page (click the tab on the top of this blog). Sara had a workshop on Saturday. She lives in Gagetown, on a farm. I loved all the animals and wanted to bring them home. Horses, chickens, angora rabbits, llamas, sheep, goats, and a cute puppy. She has a cat too. Her cat scared us. That's all I'm going to say about that. Sara is a fibre artist, making yarn from fleece - so it was neat to see all her animals, like her cashmere goat! We had a ton of fun at her workshop. Some gals weren't 'crafters' or 'into stamping' - but they had a good time and they fell in love with Stampin' Up! 's Decor Elements. That's one of the things that makes Stampin' Up! so great, is its diversity in products - we have something for everyone! Other guests at Sara's workshop were brand new to stamping and were instantly HOOKED! And were thrilled to find out they had earned a FREE Sale-a-Bration stamp set with their orders! I had my own workshop on Sunday - it was my 'Occasions/Sale-a-Bration' open house/workshop. Free stamps for those that brought their coupon they received in my monthly newsletter! I made the tag with an image from the new SAB 'Punch Bunch' stamp set. Eighteen people attended and somehow we all squeezed into my living room. This was a super FUN workshop - my best workshop EVER, in fact! So thanks to all who attended! My youngest guest was 9 years old and she just wanted everything from the get go - ah yes, I'm getting them addicted YOUNG these days...LOL This little gal's name is Meelahn, and guess what? SHE won the door prize which was the hostess benefits! I surprised everyone by letting them know my event was a 'Mystery Hostess' workshop and I would draw a name and whoever won would get all the hostess benefits for themselves! So Meelahn has some fun goodies coming her way - she was over the moon excited! I really want to thank everyone who came out to my workshop. I really, really enjoyed myself and I especially enjoyed seeing YOU! Thanks also to those of you that drove over an hour to get here! WOW! I sure did appreciate it! This was the make and take project I demonstrated at my workshops - it's a corner bookmark. Everyone seemed to really have fun making it and thought it was just adorable! If you like this and want to make it too, let me know and I'll post a tutorial. For gifts, I never give a book without a hand-stamped bookmark! And you just know that it's going to coordinate with the gift card...hee hee! The 'Punch Bunch' stamp set from SAB has been the most popular stamp set during this promotion. And I can see why - it is just too much fun! Especially that owl, with it's coordinating punch. My thank you cards for those that placed orders in January, using the 'Punch Bunch' - caaauuuute, or what?! Coming up this month, I've got my regular classes as well as a new one that I've not yet posted - it's going to be my 'Punch Bunch Class'! I'll post all the details this great class tomorrow, so be sure to come back for the details - you won't want to miss it! Enjoy the day, and HAPPY STAMPING!